A totally unique memorial in Bologna, Italy, consisting mostly of a reassembled wreck of a passenger plane that crashed under mysterious circumstances into the sea near Ustica, Sicily, in 1980! The jigsaw-puzzle-like wreck reconstruction is part of a larger art installation and it is at the same time shocking, touching and poignant. One of a kind. Not to be missed when in Bologna. More background info: The "Ustica tragedy" was a plane crash near the island of that name north of Palermo, Sicily, Italy (cf. Catacombe dei Cappuccini and Stromboli). 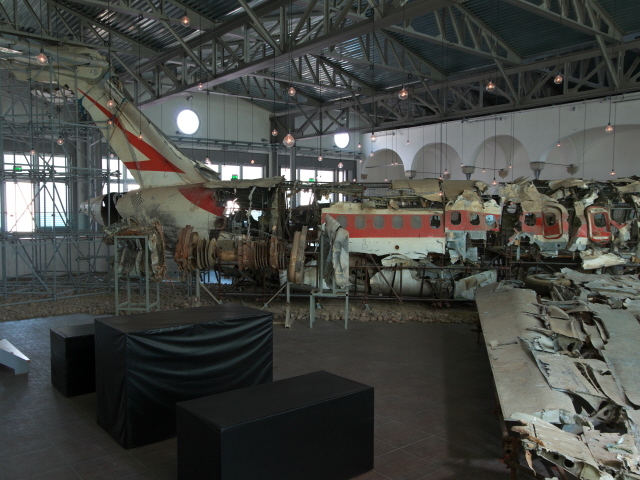 The DC-9 of Itavia flight 870 was on its way from Bologna to Palermo, Sicily, when shortly before 9 p.m. on 27 June 1980 it crashed into the sea near the island of Ustica. All 81 on board perished. The incident at first remained a total mystery. Theories of a bomb on board the plane or of engine failure were quickly refuted through forensic evidence, but what actually happened remained unknown. Only many years later (almost a decade after the crash) was it revealed that the plane had apparently been hit by an air-to-air anti-aircraft missile! That is: it was shot down! But who exactly was responsible for the (accidental?) shooting down of this passenger seat full of innocent civilians was never completely clarified and remains the subject of various conspiracy theories. Was it the Italian air force itself? Was it France? The USA? Libya? Terrorists? Apparently that night there had been an incident involving some Libyan fighter jets and various NATO aircraft as well as a French aircraft carrier. One theory claims that it may have been an attempt to shoot down Colonel Gaddafi's private plane (which may have been of the same type). The case is still shrouded in mystery. Evidence "disappeared", witnesses died under suspicious circumstances (one at the 1988 air show disaster in Ramstein, Germany!). So the allegation of a conspiracy or at least a cover-up may well be one of the rather more well-founded such allegations. Over 30 years after the event, in 2011 and again in 2013, was the Italian government finally ordered by the courts to pay compensation to the relatives of those who had died in the Ustica tragedy. 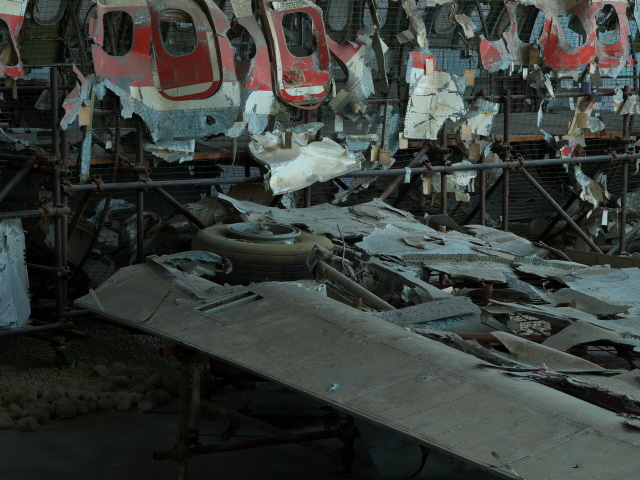 As part of an air accident investigation in Rome, the wreck of the plane, which had completely disintegrated on impact with the sea, was largely reassembled, painstakingly put back together from all the pieces of wreckage salvaged from the seabed after the crash. Initially, this wreck reconstruction was held for years out of public view in Rome. It was only in 2007 that today's display in Bologna opened, primarily taking the form of an exceptionally sombre art installation! It's the work of the famous French modern artist Christian Boltanski and most certainly has to count as an extremely unusual art installation, for sure. The official name of the site is Museo per la Memoria di Ustica. Note, however, that it really is mostly a piece of art, dark as it may be by its nature and design, but there is little further museum commodification or information, and what there is is in Italian only. What there is to see: This is not a place to visit if you are someone with an inherent fear of flying. If you do, then simply don't visit unless you really want to come face to face with your demons. But if you're not deterred and find the whole subject of plane crashes and their often mysterious causes fascinating, then there really is no place like this. Absolutely unique. The “museum” is housed in a single large exhibition hall, which looks like a humble warehouse from the outside. But once you step through the door from the reception area to the main hall, you immediately get drawn into a very eerie and very dark atmosphere. Everything is dominated by the sight of the plane wreck. Or rather its reassembled reincarnation. Remember, the plane crashed into the sea and was blown to pieces. It is amazing that all these pieces you see now have been salvaged from the seabed and painstakingly put back in place as far as that was possible. Now what you see looks almost like a complete plane. The general shape is there, and if you are familiar with typical passenger planes of the 1970s and 80s you'll recognize it as a DC-9 without problem (these days DC-9s are hardly seen in action any more). On the left side you can still quite clearly read the airline's name: Itavia (that company went bancrupt within a year after the disaster, as has happened many times with disaster-stricken airlines, cf. Pan Am after Lockerbie!). 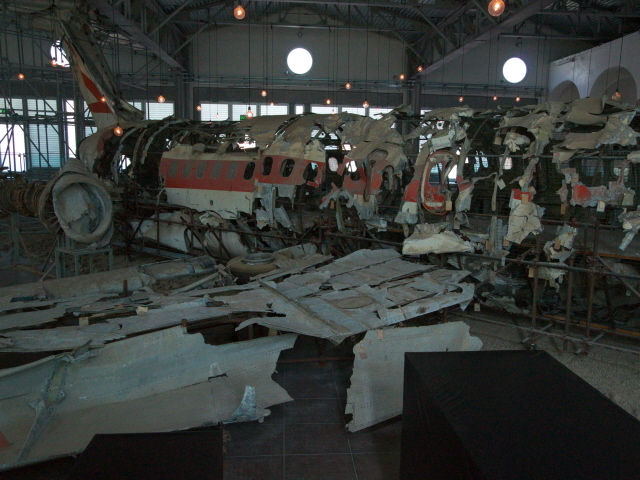 Some pieces of the plane are still quite large – e.g. the almost complete tailpiece, parts of the wings and sections of the fuselage with rows of windows. But there are also gaps, where there are no parts at all. All that is there has been attached onto a wire skeleton, so that even single pieces that are not connected to any other bits of the wreck could be mounted in exactly the correct place. You see the wheels still retraced into the wings, the unused emergency exit doors, the main doors and even the plane's own stairs, lowered as if the plane was parked on the ground. In theory these stairs would even allow access to the inside of the wreck reconstruction, but for ordinary visitors this is not permitted. You can only walk around the outer elevated gallery that is roughly at the plane windows' height. Looking more closely you can see lots of little tags and numbers attached to smaller pieces, probably used in the forensic identification of individual wreck parts in preparation for the reassembly. Along the far and near walls, black slabs that look like upright flatscreens that haven't been turned on, are mounted in long rows. They are like black mirrors. 81 of them – one for each victim. And from behind each of these black slabs sound recordings are played. Voices. As a kind of secondary 3-D sound installation complementing the visual big elements. It sounds eerie and as if coming from the netherworld. The voices are supposed to represent the victims too, as they allegedly quote general pieces of wisdom or little observations. But it's all in Italian and whispered anyway, so I didn't understand a word of what was actually being said. But that only added to the otherworldly effect. In addition to this audio installation component there is also a light installation amplifying the overall eerie atmosphere further: slightly oversized light bulbs hang from the ceiling at different heights, again 81 in total, one for each victim, and they flash on and off smoothly and periodically, at roughly the speed of breathing, punctuating with orange specks the hall's general natural light (which is streaming in through the white blinds across the large windows). It's all heavy in symbolism, of course, but it works fabulously. The whole sombreness and at the same time artistic surrealness of the installation renders you quite speechless. I can't imagine anybody rushing through this at speed and talking loudly. You almost automatically slow down and at best whisper yourself or keep totally silent. 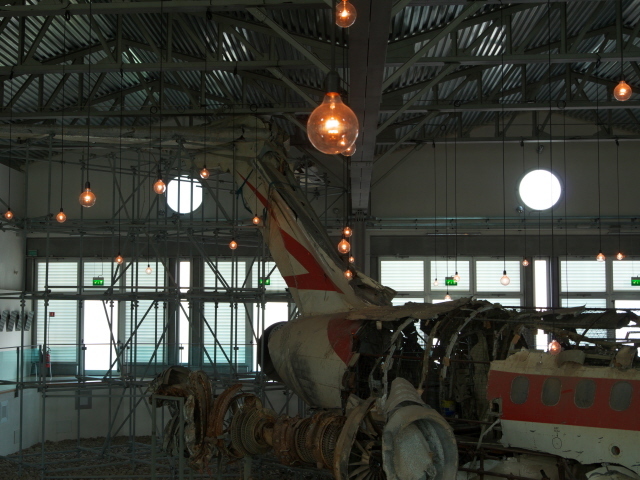 Apart from the plane wreck and the subtle artistic augmentation through sound and light, there is nothing to see. The story of the plane and the tragic crash are in no way explained or further illustrated. So if you really want to understand this unusual place you have to have done your homework in advance. Location: just outside the old centre of the city of Bologna, Italy, 2/3 of a mile (1 km) north of the central train station and a similar distance west of the trade fair grounds. Address: Via di Saliceto 3/22. Access and costs: a bit out of the centre of Bologna, but not too difficult to get to (a ca. 15-20 minute walk); free. Details: To get to the memorial you can walk from the city centre. Head north past the central train station and take the bridge just east of the station to take you across the rail tracks. Continue on northwards and then slightly to the right along Via Ferrarese. When this branches off to the right, continue straight on, where the road becomes Via de Saliceto. When you get to an open green field to the right head diagonally across it and past an old stately building and you will see the entrance to the memorial straight ahead. Alternatively you can also use bus line 25, from the city centre or the central station. Get out at the other end of the park that lies south of the memorial. Opening times: Friday to Sunday from 10 a.m. to 6 p.m.
Time required: not long; about 10 to 20 minutes will do for most visitors to view the installation and take in the eerie atmosphere. Combinations with other dark destinations: See under Bologna. Combinations with non-dark destinations: See under Bologna.